It's spring time and we all want that beautiful glow of sunkissed cheeks and a perfect complexion. Today I bring you my favorite 8 illuminators. They all happen to be high end. I have some low end ones too but they didn't swatch particularly well so I just put the beauties that really showed up in my swatches on the blog. Interested in one that you didn't see swatched? Leave a comment and maybe Jessica or I have it somewhere in our stash. Although I have 8 illuminators, they are all very different and have different textures, and work best for different occasions. Let me explain and I'll let the swatches do the talking! I have the whole line of these illuminators that Clinique carries because I love them so much. The pricetag is amazing for how huge these are. If you are fair skinned, I recommend blending the Natural shade in with your foundation for a beautiful dewy glow. If you have medium or dark skin tones, Bronze would look perfect blended with foundation, however if you are lighter skinned, Bronze looks AMAZING when it's just applied sparingly as a blush/bronzer. Blush is too pink to go over your entire face, but it really wakes up your face if you use it on its own as a blush, or layer it over the shade you already have on for a little extra pick me up. The other thing I love about these is all 3 shades have a control top pump bottle so you never get too much out. Usually 1 pump does the trick. You can also take a few pumps mixed with body lotion for a an amazing full body glow! These formulas are much more concentrated and thus you need a lot less than the Clinique product. They're best used when applied to specific places on the face, although I have heard of people mixing a couple dots with their foundation. If you wear them this way, be careful to only add a drop or two to your foundation to avoid a disco shimmer ball effect. The first three swatched products come in a nail polish-like applicator bottle. My favorite way to apply this is by putting a dot on the inner corners of my eyes, on my cupid's bow, and three little dots on the highest part of my cheekbones, and then of course blend. High beam is like a super model in a bottle- I love that it gives a pinky sheen and I love wearing it any season, but especially when I'm rocking a pink blush or lipstick. Moon beam is a bit different in that it has a peachy/pink under tone. I love wearing this to make myself look more awake and glowing and I especially love it with a tan. Sun beam is a new one in my collection that has a golden/olive undertone and gives you a glow like you got a little sun! Watt's Up comes in a stick form with a smudge stick on the other end. I haven't mastered the best way to use this product yet! The sheen is a sheer pearly shade. $38 on Birchbox- sign up HERE. This is probably the most unique luminizer I have because it comes in a little pot with a lid, and it's organic! 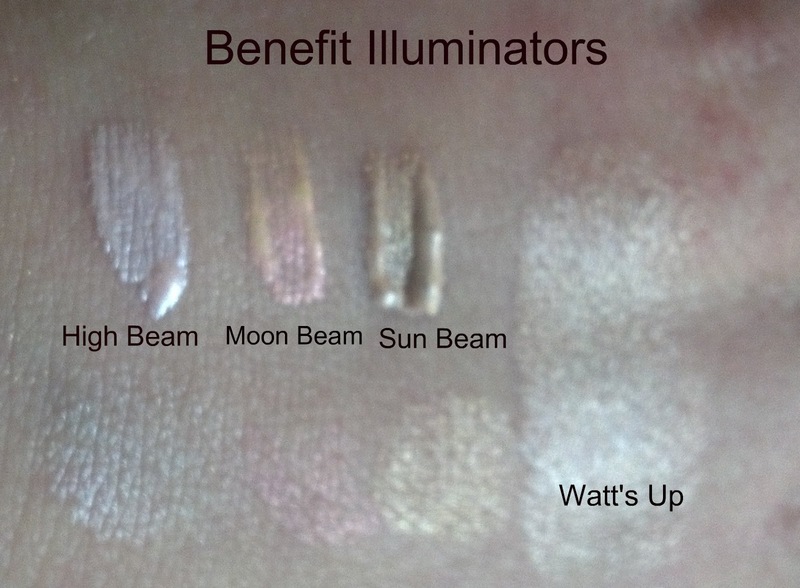 The most similar luminizer I have to this one is the Watt's Up by Benefit. This luminizer is applied with your finger and is very sheer with a slight irridescence. 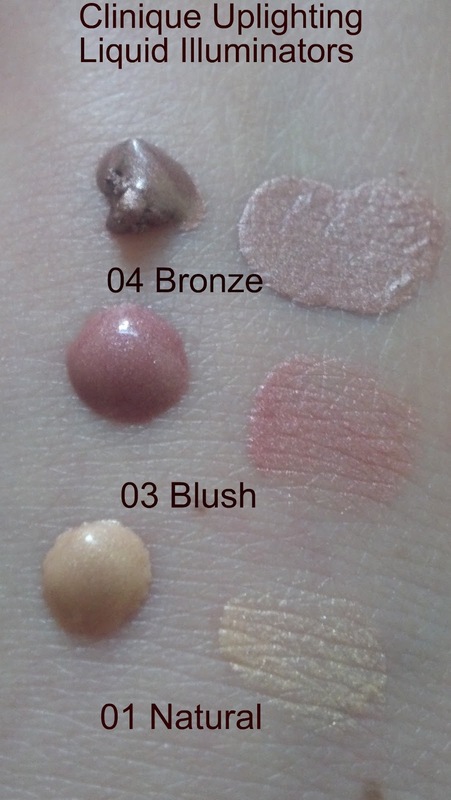 It does have tiny little flecks of glimmer (not big hunks, just the same type of shimmer other luminizers have) that seem to glint in different colors. It goes on sheer but is easy to build up. The swatch I have is one swipe of the luminizer, but you could build many more to get it to be as striking as Watt's Up. I love that this is organic and it goes on beautifully! This would be best used in specific areas on the face rather than mixing with foundation. Fantastic review on these! I use one by Anastasia that I really love, but the Clinique ones sound fantastic as well!